This beautiful new construction is located along North Carolina's pristine coastline. Holden Beach is nationally recognized as one of America's premier family beaches and is home to Ocean Spray. This amazing rental property features a whopping 12 bedroom and 12 bath floor plan that provides accommodations 32 people with elevator. Guests may choose from among the 4 Master Suites, complete with king beds, HDTV, and private baths. There are also 4 rooms with both queen and twin beds, 2 rooms with queens and 2 rooms with double bunks. ALL bedrooms have their own private bath. The large living(32 x 22) area features plenty of seating for those big family gatherings. It also has a 36' television for those wishing to keep up with their favorite programs. In the game room (30 x 22) on the next level, football fans will go wild over the 70' large screen HDTV. The cooks in the family will be anxious to showcase their culinary skills in the oversize kitchen outfitted with a 5 burner cook top, double oven, double refrigerators, as well as 2 microwaves. A double washer and dryer combination makes handling the laundry situation convenient for your guests. If you are in the mood for a midnight swim, there's a private pool. You can watch the waves roll in or the sun set over the horizon on one of the large decks overlooking both the Atlantic Ocean and the Intra coastal Waterway. We welcome the happy sounds of your children frolicking in the surf. It is a non-smoking property, no pets and is wheelchair accessible. 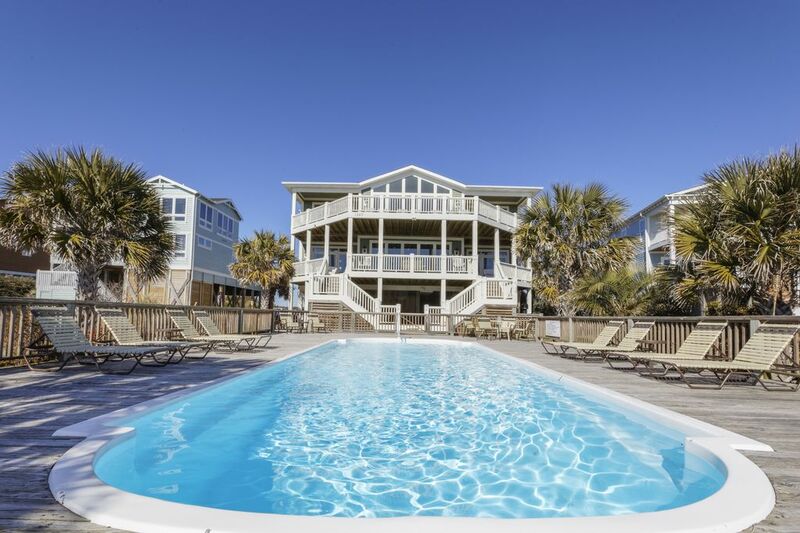 Please take a moment to review our photo portfolio and we sincerely hope that you will make Ocean Spray your place to stay the next time you visit the beautiful coast of North Carolina. This house is well arranged and my family of 25 had a delightful stay! It was nice having the elevator for my 91 year old sister and myself . Each bedroom having a private bathroom and a well stocked kitchen a big plus. The beach/ocean view is absolutely gorgeous and a nice swimming pool! I am already looking forward to being at Ocean Spray next year!! Great having bathrooms for every bedroom. Great having bathrooms for every bedroom. Best kitchen ever. Two of everything and plenty of room for multiple cooks. We did bring our own paper goods, but it would be a courtesy for Beach Butler to leave ant toilet paper left on the rolls for the new guests until they can unpack, actually any paper and laundry soap left. All in all, the greatest vacation house for large multigenerational families. Craig Greif was always available and helpful. This was is an awesome venue for a large family reunion! The house was perfect ! I can only say positive things about this house! It was clean and well stocked with everything you need ! We were 29 people in the house for a week and It never felt crowded. The pool was wonderful! We all had a fabulous time! I would rent this house again! Ocean Spray house is fantastic, the kitchen is great, top floor living room is spacious, beautiful views of the ocean & is well maintained. Plus it has a small elevator & a private pool. We had an intimate wedding here with our family staying at the house. Craig, the owner, is super responsive & helpful. He recommended great vendors to us. (Joe @ Coastal Catering was awesome). Overall, we had an amazing time staying at the house. Would highly recommend to anyone. Absolutely beautiful property! Well maintained, many wonderful amenities, beautiful beach. Friends and family were amazed, and we were VERY happy we chose this property. The owner is great, responds to emails and calls promptly, politely, and reasonably. I highly recommend this property and owner. *Use e-check option, Credit Card payments will have a 3.5% fee billed if you use a CC(excludes 1st payment) $350 Cleaning and $300 bed linens with beds made 25% down at booking, additional 2 payments can be made prior to arrival Weekend special, book a 4th night $500 *Web site will not allow me to customize a payment plan but will be done in the rental agreement.